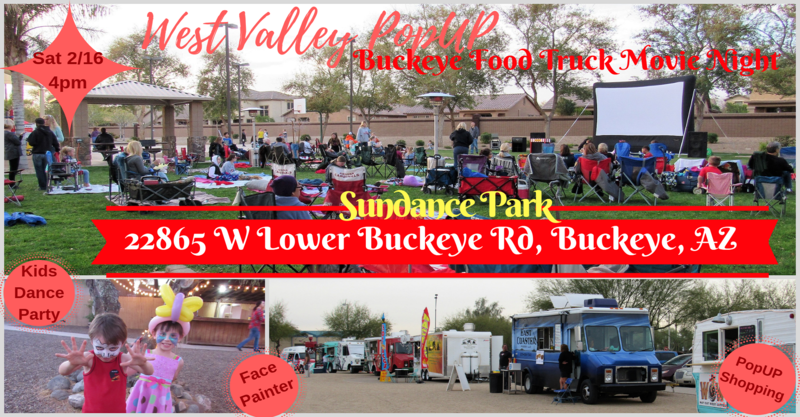 Buckeye Food Truck MOVIE NIGHT & MORE ~ Sundance Park ~ Sat 2/16! Be Our PreValentine’s Guest! Grab a blanket, chair and your family & friends and enjoy the FREE Bigscreen outdoor family movie night, Food Truck Picnic & More only at the beautiful Sundance Park in Buckeye Az (22865 W Lower Buckeye Rd, Buckeye, AZ 85326). Dress to impress! Is your princess dying to wear her princess gown again?? Bring YOUR princess to meet OUR princess! Snap a pic… Get an autograph…or just snuggle up at Princess Storytime! Don’t worry about dinner or dessert – Food truck line-up coming soon – STAY TUNED! ← Peoria Food Truck MOVIE NIGHT & MORE ~ Sat 2/2!